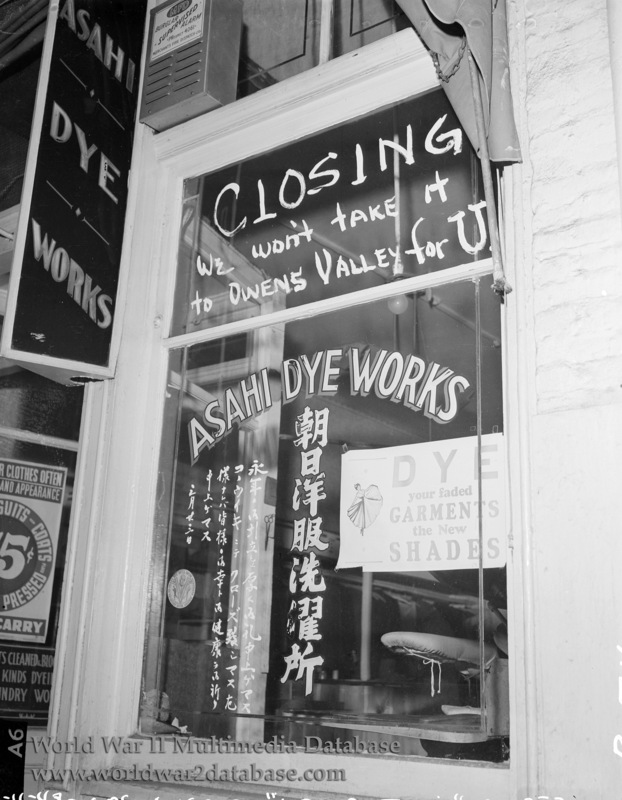 Wry notice posted by Asahi Dye Works, possibly located at 209 East 1st Street in Little Tokyo. The company frequently used the window for timely advertisements. Prior to the evacuation the store placed paper posters promoting war bonds, the United States, and Red Cross blood drives. The store was closed when Civilian Exclusion Order No. 66 (exclusion date — May 17, 1942) ordered the evacuation of between 1,600 and 1,700 persons from the Little Tokyo and Boyle Heights sections of East Los Angeles. Of this total, 865 were sent to Manzanar, the majority of the others being transported to the Turlock Assembly Center in central California. Owens Valley was the area where the Manzanar Relocation Center was located.